The initial cold front is located near Memphis this evening, with the arctic front following closely on its heels. Rain has now entered northwest Alabama and extends back through northern Mississippi, western Tennessee, northern Louisiana, and southern Arkansas. The rain will be changing to snow as the colder air infiltrates the region tonight. Forecasts are still on track for 2-3 inches of snow across the winter storm warning area, including Jasper, Fayette, Cullman, Tuscaloosa, Birmingham, Gadsden, and Anniston. 1-2 inches of snow will fall on either side of the heaviest band, including places like Demopolis, Clanton and Hamilton. A dusting to 1 inch will fall as far south as Montgomery and Selma. 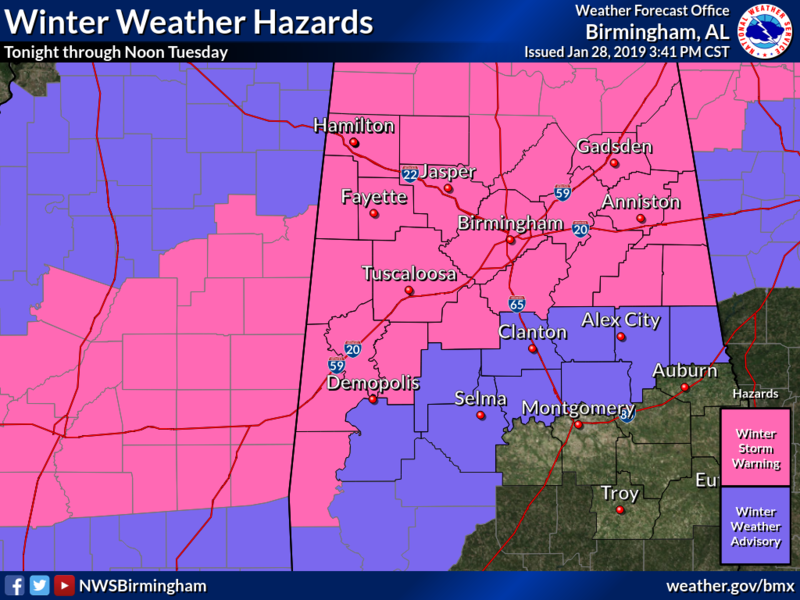 Rain should begin changing to snow after midnight over Northwest Alabama with the rain/snow line sliding southeastward during the pre-dawn hours, reaching I-59 around 4-5 a.m.